Former Milwaukee Bucks small forward Desmond Mason answers questions from students at Neeskara Elementary School. Photo by Camille Paul. When Desmond Mason played for Oklahoma State University-Stillwater, his father told him to keep a 3.0 grade point average or he would be grounded. “We had to get all As and Bs on our report card, a 3.0,” said the former Milwaukee Bucks player, referring to high school. “If we didn’t, we would be grounded for nine weeks, or until the next report card came out. Mason recently recounted the incident to a group of fourth graders working with Express Yourself Milwaukee at Neeskara Elementary School, 1601 N. Hawley Road. Students gasped when Mason told them that his father took away the car, a 1972 Nova that Mason bought his sophomore year of college, but they understood the lesson that performing well in school is important. Mason has been working with ExYo since January to help create props for the organization’s 15th annual performance on May 4. 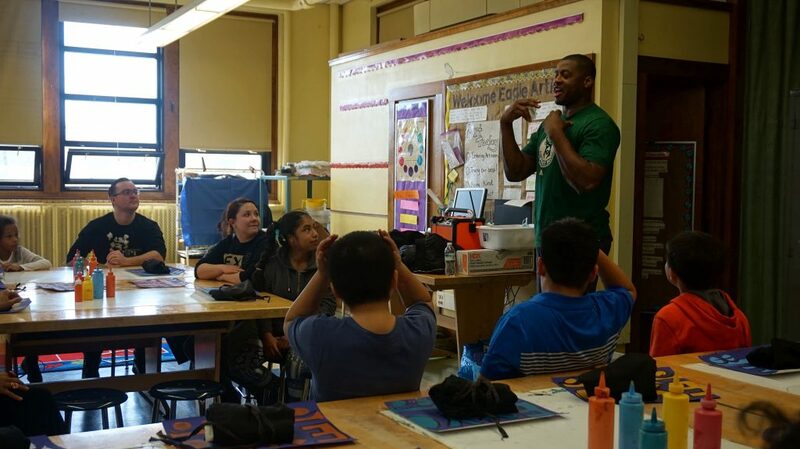 Mason has been working with Express Yourself Milwaukee since January through the Milwaukee Bucks Legends program. Photo by Camille Paul. Before Mason began his career as a professional basketball player, he had an interest in art as a boy growing up in Waxahachie, Texas. Mason works with students at the ExYo studio and visits community centers, such as SaintA, to work on props and influence young people. He tells students his life story to help them open up to him and participate in activities. While growing up, Mason’s father went to prison for selling drugs and his mother became addicted to crack, leaving him to raise his brothers and sisters. 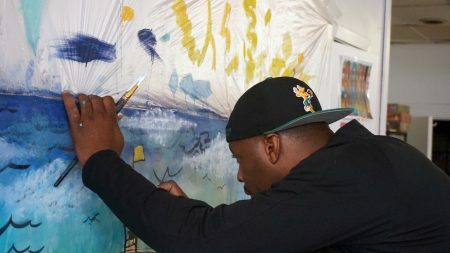 Anwar-Floyd Pruitt, a local artist, has worked with youths at ExYo for the past five years. ExYo has worked with other high-profile people, such as award-winning poet Jimmy Santiago Baca and Stomp, a percussion group that uses the body and ordinary objects to create a physical theater performance. Vance found Mason’s story to be inspiring to youth and saw the surprise on students’ faces when they heard what he and other celebrities had been through. Mason said he wants to continue to work with ExYo and similar organizations through Milwaukee Bucks Legends, a program that connects alumni players as ambassadors to nonprofit organizations in Milwaukee.